While the other Japanese forces and collaborationist Manchurian troops spread out from their bases along the South Manchurian Railway rail lines to clear the countryside, from Mukden, the Japanese headquarters in Manchuria, the brigades of the 12th Infantry Division advanced southward in the night, supported by squadrons of Japanese bombers to force the Chinese to evacuate Chinchow. The Japanese estimated the Chinese at Chinchow had 84,000 defenders, with 58 artillery pieces placed to support two separate systems of entrenchments defending the city. The Chinese first defensive line, 20 miles north of the city, was a series of trenches aimed to stop the Japanese advance at the Taling River Bridge on the Peiping-Mukden Railway. The Chinese had a second line of earthworks and entrenchments completely encircling Chinchow to fall back on if the Japanese forces broke through the first line. 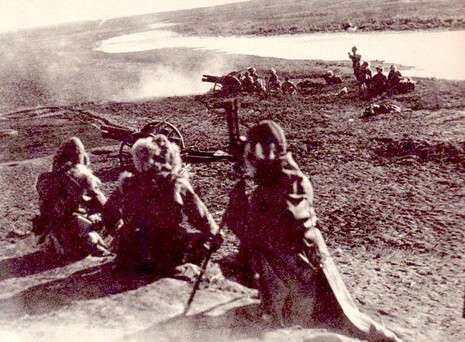 Japanese Lieutenant General Jirō Tamon's troops cautiously advanced south from Mukden. The temperature was 30 below zero, and Japanese forces were camouflaged in long white gowns. Japanese reconnaissance aircraft reported a force of at least 3,000 Chinese "bandits" waiting to defend Panshanhsien. Brushing aside these Chinese skirmishers in a series of minor clashes, Tamon prepared to meet and crush the first serious Chinese resistance, expected at Kowpangtze, 50 kilometers north of Chinchow. By the evening of December 31, 1932, the Japanese advance guard was fifteen kilometers from Chinchow on the banks of the Taling river. General Tamon halted briefly to bring up the rest of his 2nd Division, for the final drive on Chinchow. The Japanese War Office announced a radio broadcast of "The Battle of the Taling River", setting up microphones behind the Japanese lines, arranging an elaborate hookup to broadcast the sound of firing to Tokyo, but then had to call off the broadcast when the Chinese retreated without giving combat. Japanese forces occupied Chinchow on January 3, 1932, with the local populace waving Japanese flags homemade during the night to appease the conquerors. In late November 1931, General Honjō dispatched 10,000 soldiers in 13 armored trains, escorted by a squadron of bombers, in an advance on Chinchow from Mukden. This force had advanced to within 30 kilometers of Chinchow, when it received an order to withdraw. The operation was cancelled by Japanese War Minister General Jirō Minami, due to the acceptance of modified form of a League of Nations proposal for a "neutral zone" to be established as a buffer zone between China proper and Manchuria pending a future China-Japanese peace conference by the civilian government of Prime Minister Reijiro Wakatsuki in Tokyo. Manchuria rich in natural resources and sparsely populated had obvious advantages for a densely populated and resource-poor Japan. Amongst Manchuria's resources coveted by Japan were iron, coking coal, soybeans, salt and above all land, all severely lacking within the Japanese empire in 1930.